Jumhooree Party (JP) Leader Gasim Ibrahim has dismissed allegations that former Defence Minister Mohamed Nazim was conspiring with the business magnate’s Villa Group to harm senior government officials. Speaking to reporters prior to departing for Colombo last night, Gasim dismissed the allegations as a “deliberate fabrication” intended to “frame” President Abdulla Yameen’s political opponents. “We are talking about Colonel Nazim being framed and all of us Maldivian citizens know that what police are saying is self-contradictory,” he said. Gasim told reporters that Nazim was “not a madman to write a script and put it on a pen [drive],” adding that the government’s efforts to discredit Villa Group were regrettable. “What this shows is that anyone who might contest the presidency is going to be framed,” Gasim said. The Prosecutor General’s Office meanwhile withdrew charges against Nazim’s wife, Afaaf Abdul Majeed, after she was summoned to the first hearing of the weapons possession trial alongside the former defence minister yesterday. Earlier this month, Gasim’s JP formed an alliance with the opposition Maldivian Democratic Party (MDP) to “defend the constitution” from alleged breaches by the administration of President Abdulla Yameen. Both Gasim and Shahid told reporters that they would be back tonight ahead of a mass demonstration planned for tomorrow (February 27). Meanwhile, the anti-government demonstrations continued on the streets of the capital last night with protesters gathered at Malé’s main thoroughfare, Majeedhee Magu. Protesters called for the immediate release of former President Mohamed Nasheed and former Defence Minister Nazim. Senior members of both JP and MDP as well as MPs spoke at the rally and repeated calls for President Yameen’s resignation. Speaking to Minivan News at the protest, Ahmed Ali, 29, vowed to join the mass rally planned for February 27. “If not, in a couple of years I am sure my children would ask me what I did when a democracy turned into a dictatorship,” he said. Mohamed Yoosuf, 47, expressed his discontent with the criminal justice system and the law enforcement authorities. “The judiciary is political. The police are doing politician’s bidding. Even the Prosecutor General is a puppet on a string,” he said. “The country’s entire justice system has gone down in ruins with the current government. We need to improve it,”said Mauroof Hameed, 30. The government, however, insists that it is not responsible for the charges against Nasheed and Nazim, stating the trials were initiated by an independent Prosecutor General and tried through independent courts. The Maldives Broadcasting Commission (MBC) has ordered private broadcasters Raajje TV and Villa TV (VTV) to apologise for defamatory material and ordered the stations to broadcast live events with a delay to minimise future defamation. The broadcast media regulator said Raajje TV had aired an opposition Maldivian Democratic Party (MDP) meeting on September 23, 2013, in which an MDP member had defamed the Supreme Court bench. VTV is said to have aired material defamatory to MDP presidential candidate Mohamed Nasheed, MP Rozaina Adam, and Elections Commission President Fuwad Thowfeek during its daily talk show ‘Fasmanzaru’ on September 27, 2013. MBC has ordered Rajje TV and VTV to broadcast an apology and to allow the wronged party to speak in their defense by January 31. Furthermore, VTV has been ordered to broadcast ‘Fasmanzaru’ with a broadcast delay and Raajje TV has been ordered to broadcast all political events with a broadcast delay. Speaking to Minivan News, VTV CEO Ibrahim Khaleel said the MBC’s decision “limited the freedom of the press”, and that the station did not see any reason to air an apology. According to Khaleel, MBC ordered VTV to apologise for comments made on air by MP Ilham Ahmed and MP ‘Redwave’ Ahmed Saleem. “The constitution guarantees freedom of expression within the tenets of Islam and we, as a TV station, gave airtime to politicians to express their opinions. No one has said anything contrary to a tenet of Islam,” Khaleel argued. If any party feels they have been wronged, then the laws allow them to pursue defamation charges or to seek compensation through other means, he added. Deputy CEO of Raajje TV Yamin Rasheed also condemned the MBC’s decision as “discriminatory”. “It is not fair when MBC only orders specific TV channels to air specific programmes or events with a delay,” Yamin said arguing that other broadcasters must also be ordered to broadcast all political events with a delay. Yamin also expressed concern over MBC ordering the station to air an apology over an MDP MP’s comments. However, he said Raajje TV would broadcast an apology and would allow the Supreme Court judges an hour to speak in their defense. 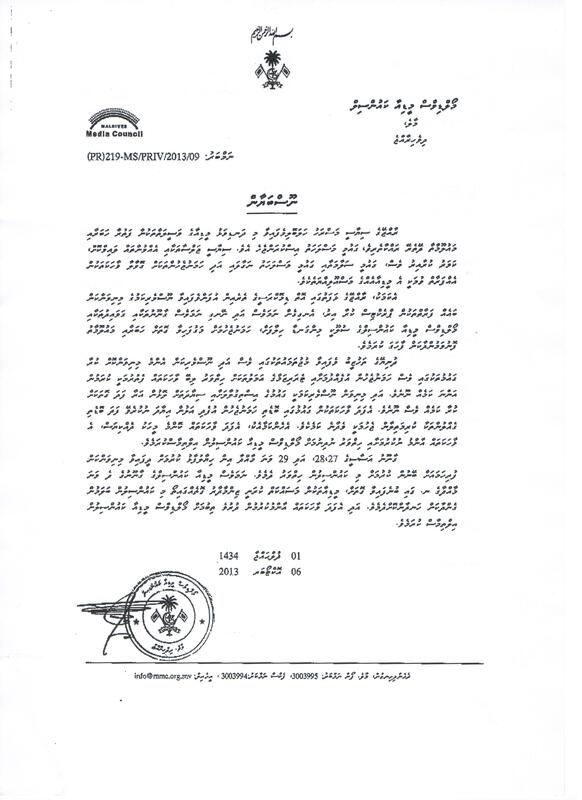 MBC has previously ordered Raajje TV, Dhi TV, and Dhi FM to apologise for defamatory material. Raajje TV was ordered to apologise in December 2013 for airing a report defaming the Supreme Court, but MBC said the report does not constitute a national security threat as alleged by the apex court. In March 2012, Dhi FM was similarly reprimanded for content aired following the overthrow of Nasheed’s administration on February 8, 2012. The Maldives National Defence Force (MNDF) has taken to the decision to provide security services to various media outlets across the country following the arson attack on opposition-aligned private broadcaster Raajje TV. MNDF Spokesperson Colonel Abdul Raheem told Minivan News that military officers were now manning “almost all” the country’s television stations as well as the premises of other media outlets. Colonel Raheem said that, rather than being a reaction to a specific threat, the MNDF had decided to assign officers to guard a number of media stations immediately following the arson attack that destroyed Raajje TV’s offices in Male’ this morning. “This was our own decision, although some [media] have requested they be provided protection,” he said, adding that officers had also been deployed to Raajje TV, which relaunched its broadcasting this afternoon. He added that MNDF officers were acting as part of ongoing efforts to provide security for any areas deemed “vulnerable”, having previously provided similar support in the past for the Maldives’ electricity and water infrastructure. The Maldives Police Service today said it was not involved with the MNDF’s security operation, with its own officers instead performing patrols outside the perimeters of media organisations. Raajje TV was attacked by a group of masked individuals who doused the station’s computers, desks and main lobby with petrol. The office’s guard was later stabbed and hospitalised with critical injuries. The attack took place despite the station having previously requested police protection following warnings of an impending attack. The attack is the second raid on the station’s building by masked assailants. During the first attack – in August 2012 – assailants sabotaged equipment in the station and cut critical cables. The main office of Villa TV (VTV), a private broadcaster owned by Jumhooree Party (JP) Leader – and third-placed presidential candidate MP Gasim Ibrahim – was attacked during anti-government protests on March 19, 2012. Extensive damage was reportedly caused to VTV and its property, with the station briefly being brought off air – an act claimed by the station’s owner to be tantamount to “terrorism”. The Maldives Media Council meanwhile today released a statement condemning the Raajje TV attack as an attempt to “eliminate” one of the country’s most watched broadcasters, calling for security forces to do more to protect media outlets and journalists. The MMC last week declared its intention to file a no-confidence motion in the Majlis against Maldives Broadcasting Commission (MBC) members via Parliament’s Independent Institutions Committee. The council stated its belief that the broadcasting commission had failed to create a healthy broadcast media environment, instead creating fear and discomfort, and that it was therefore unable to fulfill the Broadcasting Act’s mandates. MMC member and Maldives Journalist Association (MJA) President Ahmed ‘Hiriga’ Zahir meanwhile today maintained that media should not cover live events and other developments in the country in a manner that would incite violence. Zahir confirmed the MCC also published a statement yesterday (October 6) criticising any media found to be trying to incite institutions or individuals to perform violent acts. The statement specifically condemned any media found to be spreading calls for “terrorism and unrest”, something it said was not permitted even in nations regarded as leading in international standards of press freedom. Zahir said that the MCC were aware of a number of examples where numerous unspecified media outlets had been covering news in a way that could create unrest. “Sometimes the language used by [these media outlets] goes beyond what is acceptable within democratic values,” he said. Zahir cited one notable example of media inciting unrest was by covering the statements of certain politicians who encouraged people to “violate the law” and go against state institutions. He added that all media had a responsibility to the nation to decide whether or not to cover statements that might lead to violence or unrest. Asked if the MMC’s statements could infringe on constitutionally-guaranteed press freedom, Zahir argued that the media oversight body was responsible under law to ensure such media freedoms were used in the “right manner”. “The point is media needs to work for a better society. Media freedom has to be for the betterment of society,” he clarified today. The High Court has upheld a Criminal Court ruling sentencing a man found guilty of throwing stones at private broadcaster VTV to seven years imprisonment. Eight men including Mohamed Hameed were given seven year sentences for throwing stones outside the station during anti-government protests on March 19, 2012. The demonstrators were protesting the new President Dr Mohamed Waheed from giving the opening address to the first session of parliament, following his controversial arrival to power the previous month. In addition to Hameed, the Criminal Court also sentenced Ismail Hammaadh of Maduvvari in Raa Atoll, Ahmed Hameeed and Hussein Hameed of Alifushi in Raa Atoll, Ahmed Naeem of Henveiru Ladhumaageaage, Hussein Shifau Jameel of Maafannu Nooruzeyru, Aanim Hassan of Ferishoo in North Ali Atoll, Ahmed Muheen of Galolhu Haalam and Mohamed Hameed for vandalising the channel. The building, as well as the soldiers guarding its entrance on Sosun Magu, came under attack as police tear gas forced the protesters south, past the building from the police barricades near to the parliament building. Appealing the sentence, Hameed argued that it was extraordinary practice for the court to impose the maximum possible sentence on a first time offender with no criminal record. However the High Court, noting that the sentence was three to seven years, deferred to the discretion of the Criminal Court judge. VTV is owned by MP Gasim Ibrahim, a resort tycoon, presidential candidate and member of the Judicial Services Commission (JSC) tasked with disciplining the judiciary. The Maldivian Democratic Party (MDP) has expressed concern over President Dr Mohamed Waheed’s appointment yesterday of former Department of Judicial Administration (DJA) Spokesperson Latheefa Gasim to the Judicial Service Commission (JSC), alleging the appointee had ties with the Jumhoree Party (JP). In a press release yesterday (June 24), the party characterised Latheefa Gasim’s appointment as an attempt to “increase the political and other forms of influence of a particular group and promote their self-interest” through the judicial oversight commission. “Latheefa Gasim is the wife of Mohamed Ikram, who is employed by Jumhoree Party presidential candidate Gasim Ibrahim as the head of V-media’s political department and a presenter of VTV, who campaigns for Gasim Ibrahim,” the party said, adding that Ikram was also a member of business magnate Gasim’s JP. JP Leader Gasim Ibrahim is the parliament’s representative on the 10-member JSC, which consists of three judges from the three tiers of the judiciary (trial courts, High Court and Supreme Court); a representative of the President, the Attorney General, the chair of the Civil Service Commission; the Speaker of Parliament, a member of parliament elected by the People’s Majlis, a member of the public selected by parliament; and a lawyer elected by licensed practitioners in the Maldives. Gasim, the JP MP for Alif Dhaal Maamigili, is the chairman of the Villa Group of businesses, which owns resorts, tour operators, a cement packing factory, a gas provider, an airline and several retail outlets. The MDP alleged in its statement that Gasim has been “working ceaselessly” through the JSC to bar former President Nasheed from the upcoming presidential election on September 7, adding that the rival candidate has made public remarks to that effect. The press release also noted that Latheefa Gasim had made several statements to the media concerning MDP presidential candidate and former President Mohamed Nasheed’s trial at the Hulhumale’ Magistrate Court. The former DJA spokesperson was not responding to Minivan News at time of press. Latheef Gasim’s appointment yesterday followed the removal of Mohamed ‘Reynis’ Saleem by President Waheed last week ostensibly over allegations that the lawyer commissioned gangs to retrieve money owed to him. The President’s appointee on the JSC was summoned to the police for questioning over the allegations in May. The Criminal Court meanwhile refused to grant police an arrest warrant to take Saleem into custody, a decision which was backed upon appeal by the High Court. Saleem was the defence counsel of Deputy Speaker of Parliament Ahmed Nazim in criminal cases involving an alleged scam to defraud the now-defunct Ministry of Atolls Development. The cases were dismissed by the Criminal Court shortly after the controversial transfer of presidential power on February 7, 2012. The special rapporteur stated that there was near unanimous consensus during her visit that the composition of the JSC – which includes representatives from all three branches of government instead of exclusively the judiciary as was the norm in other nations – was “inadequate and politicised”. This complaint was first highlighted in a report by the International Committee of Jurists (ICJ) in 2010. “Because of this politicisation, the commission has allegedly been subjected to all sorts of external influence and has consequently been unable to function properly,” Knaul observed. The International Federation of Journalists (IFJ) has condemned an attack on a Villa Television (VTV) cameraman while he was reportedly covering a Maldivian Democratic Party protest. The Maldives Journalist Association (MJA), an affiliate of the IFJ, highlighted that attacks on journalists are becoming common during political rallies in the Maldives. Due to the attack on VTV cameraman Rilwan Moosa, the MJA has called on the Maldives Media Council to initiate steps to ensure a safe environment for reporting public events. The IFJ, who represent over 600,000 journalists in 131 countries, has expressed the need for greater safety for journalists amid the political tension in the Maldives. The Criminal Court has sentenced eight men charged with the vandalism of private TV station Villa TV (VTV) to seven years imprisonment. The court ruled that the witnesses produced by the state told the court they saw the eight men throw stones at VTV security personnel and Maldives National Defence Force (MNDF) officials outside the building and that the testimony was enough to find the accused guilty of the crime. The judge also said the court was produced with video footage and pictures of the events that day. The Prosecutor General (PG) had pressed charges against Ismail Hammaadh of Maduvvari in Raa Atoll, Ahmed Hameeed and Hussein Hameed of Alifushi in Raa Atoll, Ahmed Naeem of Henveiru Ladhumaageaage, Hussein Shifau Jameel of Maafannu Nooruzeyru, Aanim Hassan of Ferishoo in North Ali Atoll, Ahmed Muheen of Galolhu Haalam and Mohamed Hameed for vandalising VTV. The attack on the television station occurred during protests against the re-opening of the People’s Majlis on March 19. The building, as well as the soldiers guarding its entrance on Sosun Magu, came under attack as police tear gas forced the protesters south, past the building from the police barricades nearer to the Majlis building. President Dr Mohamed Waheed Hassan Manik delivered his opening address to parliament amid widespread anti-government demonstrations, after the Maldivian Democratic Party (MDP) took to the street to prevent him from giving the speech. Violent clashes between police and protesters sparked major unrest in the capital Male’. Villa TV is owned by resort tycoon, Jumhoree Party (JP) leader and MP Gasim ‘Buruma’ Ibrahim, who is in a coalition with Dr Waheed’s government. Gasim is also a member of the Judicial Services Commission (JSC), the body charged with oversight of the judiciary. The Criminal Court has commenced the trial of five men accused of vandalising the offices of private broadcaster Villa Television (VTV) during protests held in Male’, on the day President Dr Mohamed Waheed Hassan Manik delivered his inaugural Presidential Speech. VTV is owned by Jumhoree Party (JP) Leader Gasim Ibrahim, which is represented in President Waheed’s coalition government. The Prosecutor General (PG) has pressed charges against Ismail Hammaadh of Maduvvari in Raa Atoll, Ahmed Hameeed and Hussein Hameed of Alifushi in Raa Atoll, Ahmed Naeem of Henveiru Ladhumaageaage, Hussein Shifau Jameel of Maafannu Nooruzeyru, Aanim Hassan of Ferishoo in North Ali Atoll, Ahmed Muheen of Galolhu Haalam and Mohamed Hameed. Newspaper ‘Haveeru’ reported that a lawyer representing the PG’s Office pressed charges against the five suspects for their alleged violation of legislation banning threatening behaviour and the possession of sharp weapons. All of the respondents have denied the charges against them. Local media reported that the PG’s Office lawyer was given the opportunity to produce evidence including witness statements, pictures and video footage provided by VTV staff present at the area when the incident occurred. Police and MNDF officers were also produced to the court for their accounts. On March 19, President Dr Waheed Hassan Manik delivered his opening address to parliament amid widespread anti-government demonstrations, after the Maldivian Democratic Party (MDP) took to the street to prevent him from giving the speech. Violent clashes between police and protesters and sparked major unrest in the capital Male’. Following violent confrontations between civilians and security forces during the day, 99 people were arrested, with a number of security officers and protesters reported injured. Police Superintendent Ahmed Mohamed previously said that the attack on VTV was itself an act of terrorism and that those involved should receive “the harshest punishment possible”.